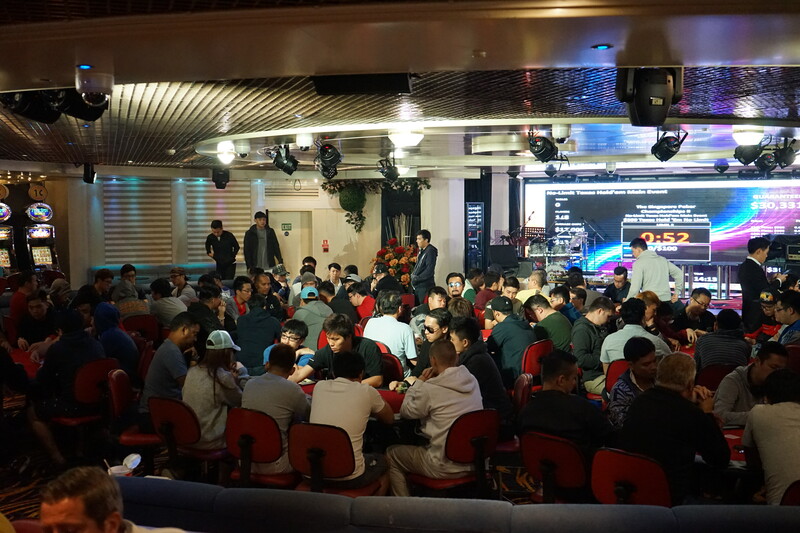 The Singapore Poker Championships II continued its journey last weekend on the beautiful MV Aegean Paradise, almost matching the record-breaking stellar attendance from SPC I. Despite the Formula-1 weekend, 254 participants turned up representing a multitude of countries, including France, Holland, Malaysia and Iran. 80 Main Event runners managed to navigate the difficult Day 1 pools littered with former champions and finalists, for a shot at Day 2. Among them were defending champion Liew Teck Wee and former champions Daniel Chua, Lim Min Soon, John Low, Jimmy Yar, Muhd Dasreen, K. K. Liew and Freddy Quek. At the end of Day 1, only 2 players managed to barely cross the 6-figure chip count mark - Chen Chow Chin (100,600) and overnight chip leader Chua Xue Wei (106,800). 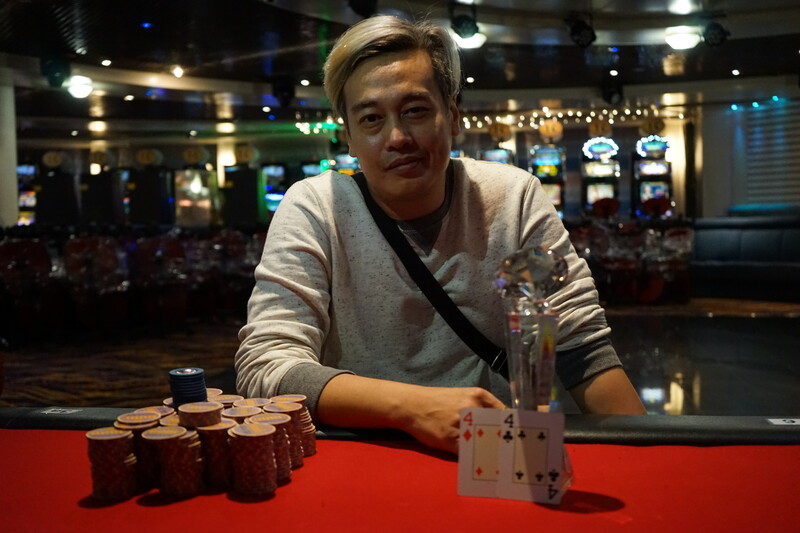 After a gruelling 3 hours and many a poker giant felled, the bubble finally burst when Daniel Chua busted out in 28th after a bad beat on the river. 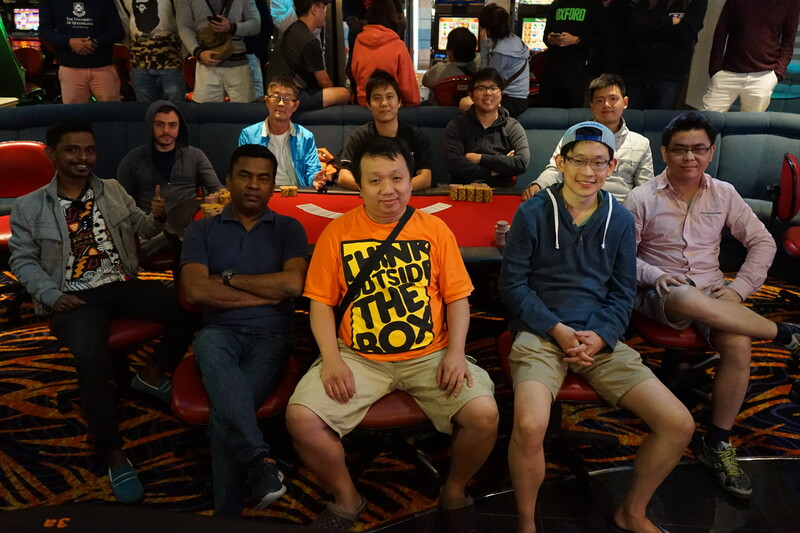 John, Jimmy and defending champion Liew Teck Wee fell just short of making the final table while Lau ‘Bomberman’ Heng Seng and Julien Malaise were on heaters, accumulating a hefty portion chips in en route. 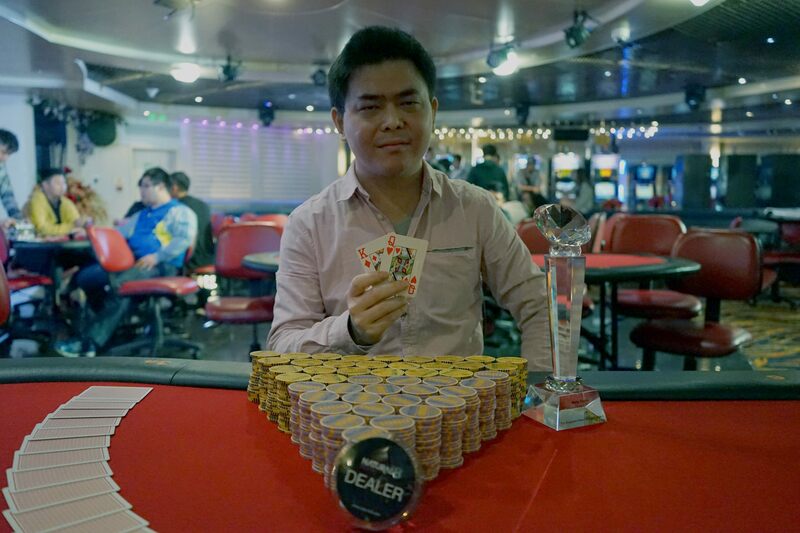 The final table bubble belonged to Kwa Ming Han who accepted a prop bet with his friends to wear only a bathrobe throughout the duration of the tournament. He proved to be quite the spectacle but also a resilient poker player. And then there were 9. Led by the big stacks of Bomberman, Julien and Haresh Shanmugam, with a combined total of more than half the chips in play, the other players needed to step up their game to avoid being steamrolled. This is the part where we tell the story of the Lew Express. After a couple of hands Lew Yin Hao decided to turned it up to full speed and not look back. He was involved in a 3-way all in situation with him covering the other two holding pocket Kings. He dominated pocket 7s but was a big underdog to Aces. However, he held the King of spades, and the board tabled a 4-card spade flush by the river knocking Tai Rong Sen (9th) and Ranganathan Hemagiri (8th) out. That got his supporting railbirds going. On the next hand Julien put his chips all in with two black Jacks but Lew simply woke up to Aces in the big blind and made the easy call. The board ran K7TT6 and, unable to hit his 2-outer, Julien was sent to the rail in 7th place. Suffice to say the crowd went absolutely wild. Lew was in the thick of things again on the very next hand. Short stacked Tiong Tin Yong got in good for all his chips with A8 of hearts but Lew had other plans despite having Q7 of clubs, calling Tiong’s all-in. The flop dropped AdJc7d with Tiong still leading but the crowd went ballistic when 7h dropped on the turn and an overkill Qh on the river for a full house. Tiong exited in 6th shaking his head in disbelief. Next in line on the collision course was short stacked Alex Peck. He casually called Alex’s all-in with 9s2d, finding himself against pocket deuces. Lew expectedly spiked a 9 on the flop much to the chagrin of Alex who busted out in 5th place. Alex, however, won the running last longer bets with some players, netting himself a cool 4-figure bonus. Haresh SN and Jeffrey Lee, who had hitherto been bystanders among the carnage left behind by the Lew Express, finally took matters into their own hands in the blinds. Haresh found his Q5 dominated by Jeffrey’s K5 and could not improve by the river. The ever jovial Haresh took to the rails in 4th. With that slight interval, the Lew Express got right back into the swing of things soon after. Jeffrey tried to bank on K5 again to steal Lew’s big blind but Lew had none of that and called with AT. The board ran 98Q67 for a higher straight to send Jeffrey back on the next ferry in 3rd. Heads up action started off with players counting their chips with intention of making a deal. A deal was struck between Lew and Bomberman quickly and both were off fighting straight away for the trophy. After several hands where chips moved hither and dither, Bomberman was severely crippled losing a humongous flip. The defining hand saw Lew’s KQ dominating and holding up against Bomberman’s Q9 to crown Lew Yin How as the champion of the Singapore Poker Championships II! The Singapore Poker Championships congratulates all prize winners, and thanks all participants for making the SPC an astonishing experience. See you all again in December! Congratulations to all winners, and to all participants for making SPC II the unforgettable weekend it was.